I wasn't quite sure what Norberta would be when I started -- as it turns out, she wanted to be a baby dragon. But leave off the wings and spines, and she looks like a dinosaur or an alligator -- whatever works best for the kid (or grownup) in your life. 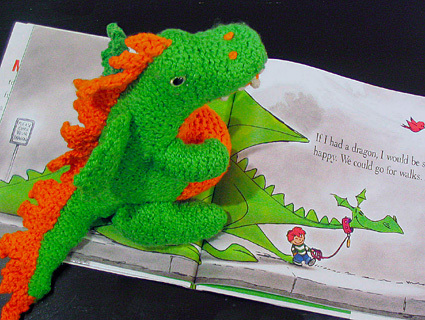 To create a more scaly look for the dragon, I used the stockinette pieces with the purl side out. This has the added benefit of hiding the wrapped stitches created when using short rows to shape the body and the round belly. So no need to worry about picking up the wraps on the way back! 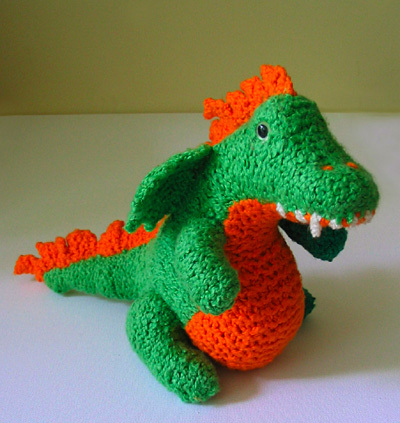 Don't worry about matching measurements exactly -- the knitting will stretch into shape when stuffed. CO using the Long-Tail method at the beg of each piece. CO sts at row ends using Backward Loop method. To make assembly easier, leave slightly longer than usual tails at the CO and BO ends of each piece. This project is worked with 2 strands of yarn held together throughout. Note: While this piece and the front and hind legs are being worked, the smooth, knit side of the stockinette st fabric will be considered the RS. When sewing the pieces together, this will become the WS, and the bumpy, purl side of the fabric will face out. Using two strands of MC held together, CO 6 sts. Rows 1-5: Beginning with a p row, work 5 rows in stockinette st.
Row 6 [RS]: [K1, kfb] 3 times. 9 sts. Rows 7-11: Work in stockinette st.
Row 12 [RS]: [K2, kfb] 3 times. 12 sts. Rows 13-15: Work in stockinette st.
Row 16 [RS]: [K3, kfb] 3 times. 15 sts. 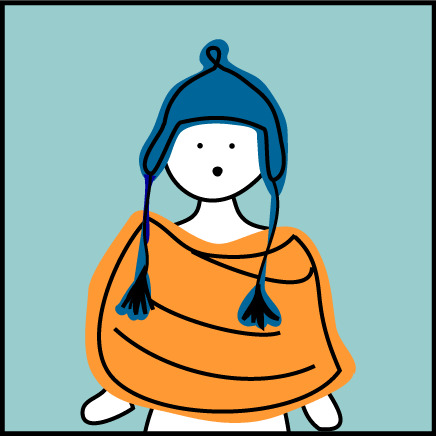 Rows 17-19: Work in stockinette st.
Row 20 [RS]: [K4, kfb] 3 times. 18 sts. Rows 21-23: Work in stockinette st.
Row 24 [RS]: [K5, kfb] 3 times. 21 sts. Row 25 [WS]: P all sts. Row 26: K4, w&t. P to end. Row 27: K6, w&t. P to end. Row 28: K8, w&t. P to end. Row 33 [WS]: P all sts. Rows 34-43: work in stockinette st.
Row 55 [WS]: P all sts. Using 2 strands of MC held together, CO 10 sts. Row 1 [RS]: K10, CO 1 st. 11 sts. Fold a front leg in half lengthwise, with purl side of fabric facing out. Use the yarn tails at the CO edge to sew several running sts. Pull yarn tight to gather. Repeat at the BO edge. Add stuffing, and then use the tails to sew the leg closed. Repeat for the other front leg. 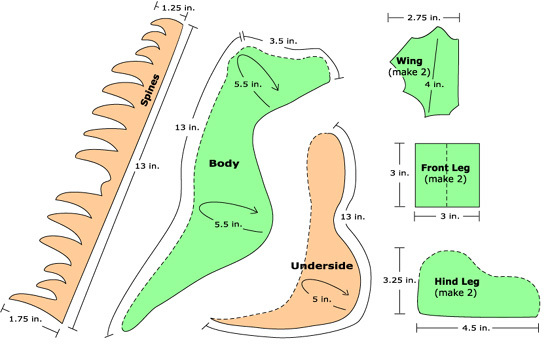 Fold hind leg in half as shown in the schematic, with purl side of fabric facing out. Beginning at the CO edge, gather the edge as described above. Sew side edges together, leaving about 2 inches open. Add stuffing, and then sew closed. Repeat for the other hind leg. Center the spines on the back of the dragon; use CC to sew in place. Starting at head, begin sewing Underside to Body, stopping about halfway down the neck. Make a small roll of stuffing, about 3 inches wide by 1 inch in diameter. Place inside top back of the head to make the eye ridge more prominent. Stuff the rest of the dragon head, taking care not to dislodge the eye-ridge stuffing. Continue sewing the Underside to the Body, leaving about 4 inches open along one side. Sew tail seam. Finish stuffing the dragon body and tail. The stuffing should be firm, but not so full that it shows through the fabric. Place hind leg on main body so that the larger end is about even with the start of the underbelly, or where it looks best. Sew securely in place. Repeat with other hind leg on opposite side. Place front leg on main body, just above point where belly starts, or where it looks best. Sew securely in place. Repeat with other front leg on opposite side. Place wing on main body, about 1/2 inch to 3/4 inch from spine, and centered with the front legs, or wherever it looks best. Sew securely in place. Repeat with other wing on opposite side. Use sewing thread and a sharp needle to sew on button eyes, if desired. To further emphasize eye ridge, sew on one button, pass the thread through the head to the other side, and pull in slightly before sewing on the second button. 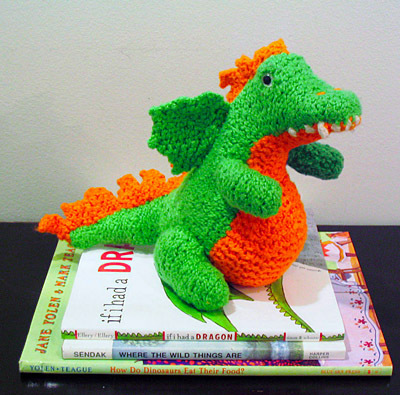 Note: If the dragon will be gift for a small child, replace the buttons with embroidered eyes. Squash the snout slightly to flatten it. Then use CC yarn to embroider two French knots for nostrils, sewing down through the snout to the Underside to help keep the snout slightly flat. Optional: Use a scrap of white yarn to embroider the teeth. To make the fangs, finger crocheting two chains, and then sew back up through the chain. Kate Kuckro lives in San Francisco, where she spends as much time as possible knitting, reading, and baking (The first two work well together, the third one not so much). She has contributed patterns to Knitty, Big Girl Knits, and Knitscene, and has several more in the works. To see more of her work and to read about her knitting inspirations and experiments, please see her website.